Imagine you have an unwanted house guest who is taking advantage of your hospitality. They eat your food, watch your TV, leave their dirty clothes all over your home and otherwise make a pest of themselves. Not only do they fail to help with any household chores, they make your work harder because you have to cook and clean for them, too. I'm certain you would want to kick them out of your house at the earliest opportunity. Well, there are tiny creatures that do similar things when they take up residence inside the body. These creatures feed off your nutrients, leave their waste products in your body and zap your energy. We call these unwanted creatures parasites. 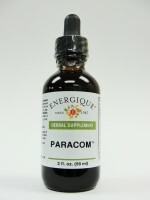 Take the Herbal products (images) as suggested on the label and for the homeopathic product (Paracom) carry it with you all day. Take a few drops (4 or 5) under the tongue and keep it there for a minute then swallow. Do that 4 or 5 times a day. Below is a list of other suggested products. Those in bold (below) are key products for the health issue explained on this page. For details and ordering click on the bold names below or on "Add to Cart". Fight parasites with Para Cleanse with Paw-Paw, an ideal foundation for treating intestinal parasites. Take the contents of one cello packet twice a day 15 minutes before your morning and evening meals with at least 8 oz. pure water. Continue the program for 10 days, eating a lot of fresh fruits and vegetables. Notes: 1. Always drink plenty of (mineral) water (Echo or Evian) when on a cleansing program. 2. Since family members often share parasites with each other, best results are obtained when all family members use the same program at the same time. Below is a list of suggested products. Those in bold are key products for the health issue explained on this page. For details and ordering simply copy a product's name in the search box above or click on the bold name. There are many types of parasites that can make your body their unsuspecting host. Besides various worms (like tapeworms and ringworms), there are microscopic, single-celled organisms like giardia, H. pylori, candida and amoebas, which can all be considered parasites. In fact, there are over I ,OOO organisms that are known to be parasites in human beings. Many of us think that parasites are something that only affect people living in third-world countries. However, this simply isn't the case. Parasites are far more widespread in North America than most people are willing to believe. In fact, if single celled organisms are included, probably 80-95% of us have at least one form of parasite inside our body, which may, or may not, be affecting our health. Parasites can be very hard to diagnose. A stool analysis may or may not reveal their existence, because even if parasites are present, they may or may not be present in any particular stool sample. Fortunately, they do leave telltale signs of their presence-chronic fatigue or illnes that just doesn't seem to get better, nervousness, teeth grinding, diarrhea, ulcers or digestive pain, extremes of appetite, weight loss or gain, anemia, itching (especially in the rectal area) and lowered immune response. These are some of the more common symptoms. If you have pets or animals and they have parasites, there is a high probability that you may, too. It's also easy to pick parasites up when traveling. so if you've experienced a change in health after traveling, it could be parasites. Even when diagnosed correctly, parasites can be hard to eliminate. It takes powerful medications to kill parasites, and typically these medications are toxic to healthy tissue as well. Even some of the stronger antiparasitic herbs have some toxicity. However, our approach to parasites is going to be only partially effective if we just focus on trying to kill them. One way to coax an unwanted guest to leave is to stop being a good host. In the body, this translates into altering the biological terrain to make it unfriendly for parasites. When one does this, smaller doses of less toxic antiparasitic remedies can be very effective in getting rid of them. This is where herbs can excel over chemical drugs. While they may not be as strong as drugs at directly killing the parasites, they are exceptionally good at helping to alter the host environment to make it unfriendly to parasites. If you've been diagnosed as having parasites, then you certainly want to serve up an eviction notice for the critters. However, it may be helpful to do a periodic parasite cleanse even if you haven't been diagnosed with parasites. For instance, if you have pets or animals, probably a good practice to do the Para-Cleanse program at least once a year, just for prevention. It's also a good idea to do a parasite cleanse after traveling (especially to third world countries). Another time to try a parasite cleanse is if you have chronic health problems that you can't seem to get rid of no matter what you do.